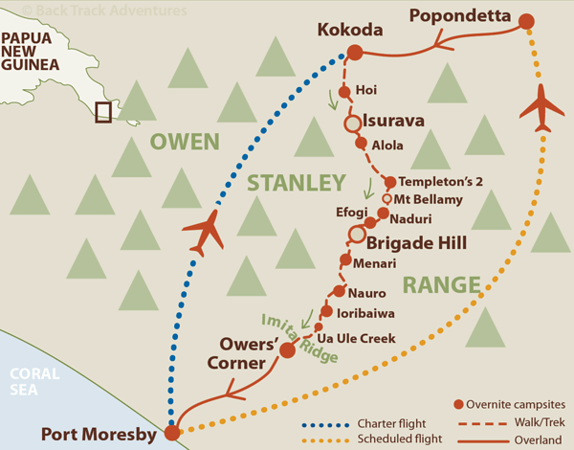 These pictures have been selected to show the Kokoda Track as it was during the journey of our band of eight participants and the local leaders, porters and kitchen staff from Kokoda to the accommodation at the end in Port Moresby. Almost all the photographs shown on these daily abstracts were taken by Chris and were kindly shared amongst the members of the group by him. I would like to thank him very much for his wonderful images and for so generously allowing the rest of us access to them for our own records. Not all our overnight locations are shown on the map, but it does show the principal locations mentioned in the daily Galleries.